Tucson boasts some great hamburger houses – and even a fair number of places offering vegetarian burgers. But a truly great vegan burger? Now that is hard to come by. We proudly offer for your consideration the Vegan Bistro Vegan Burger – 100% vegan – burger and bun. The Vegan Bistro vegan burger (just try saying that fast 3 times!) features a mouthwatering Tepa patty cradled in a light and healthy spelt flour bun. We use only 100% vegan Tepa burger patties. 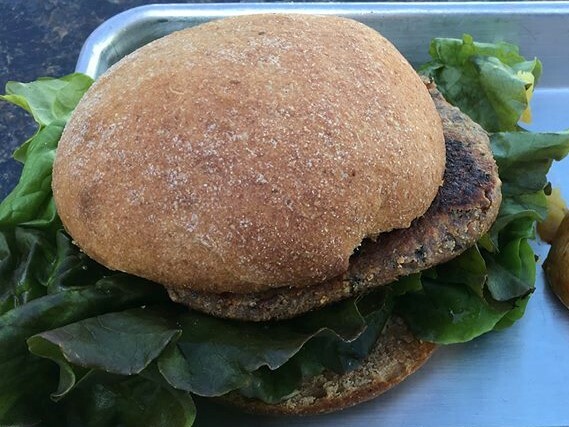 Made right here in Arizona, Tepa burgers include healthy and vegan ingredients like Arizona whole tepary beans, kale, sugar chilies, sunflower kernels, whole oats and whole grain blue cornmeal. What they don’t include is the egg filler you will find in “veggie” burgers on most vegetarian menus. Without that egg binder, our burgers are much harder to cook to perfection. But our grill masters have got this down to a science so you get a super healthy and super tasty burger without the added filler. And then there’s the bun you get with a Zinman’s Food Shop burger. That bun does more than just keep your hands clean while you eat. Made from our own locally grown and house milled spelt flour, this light and lovely bun adds its own subtly nutty flavor. Spelt is very low gluten and our bun recipe is completely dairy and egg free too. If you are serious about vegan eating, the Vegan Bistro Vegan Burger is the one to try!